This Lithium Iron Phosphate battery is the safest and most stable of the Lithium battery chemistry types, making it ideal for residential use. The system will provide the residence with 61.2 kilowatts of continuous backup power and 166 kilowatt-hours of total energy storage capacity. This is almost three times more energy than can be stored using the Tesla Powerwall battery. 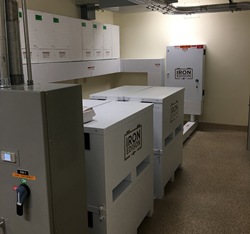 Iron Edison has deployed a custom Lithium Iron battery as part of a solar installation at a 45,000 square-foot California home. The project will feature a 52 volt, 3200 amp hour Lithium Iron battery providing up to 2000 amps of continuous charge/discharge capability. Solar energy is provided from an array of 130 x 300 watt LG solar PV panels. 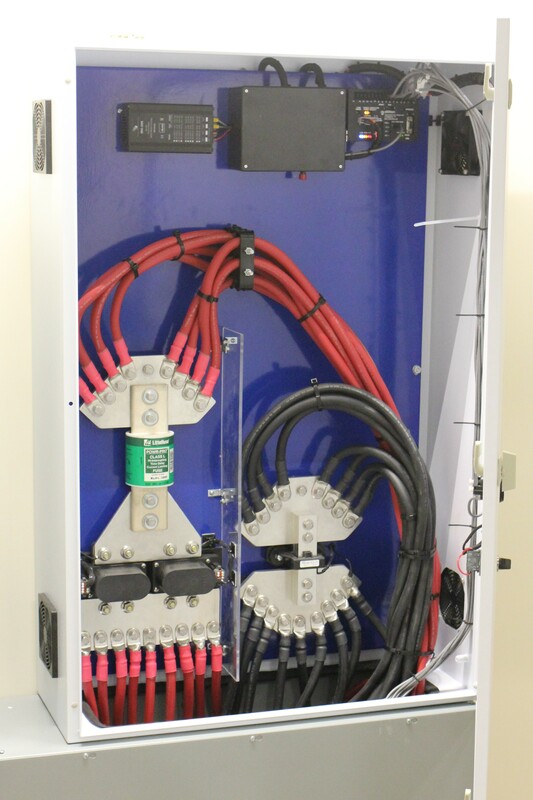 Backup power comes from 9 x 6800 watt Schneider Electric Conext XW+ inverters, all tied together using a custom designed Peterson 3-phase combiner box. Iron Edison owners Brandon and Maggie Williams, together with a small team of the company's design and installation specialists, worked on-site to install the battery system and oversee its connection to the rest of the solar PV components. The massive project was designed by Manfred Thyssen of the Temecula, Calif.-based OnTime Energy Solutions. A family-owned and operated business, OnTime has been providing Southern California residents with reliable HVAC and solar energy services for over 20 years. Designed and assembled by Iron Edison, this completely maintenance-free Lithium Iron battery has increasingly become a go-to for large scale residential solar energy systems like this one. Its Lithium Iron Phosphate battery chemistry is the safest Lithium battery chemistry type, which helps it avoid the hazardous “thermal events” seen with other Lithium Ion chemistries. The lithium iron batteries from Iron Edison are compatible with all industry-leading inverters and charge controllers such as Schneider Electric, Outback Power, Magnum Energy, MidNite Solar and SMA. This allows residential users to save time spent hunting for compatible parts, giving them a more convenient, hassle-free installation experience. Based in Denver, Colo., Iron Edison Battery Company offers Nickel Iron and Lithium Iron batteries for solar energy storage, as well as complete solar system design services. The Iron Edison team has designed thousands of off-grid and battery backup systems ranging from large-scale commercial systems in the US to rural solar energy systems for small mountain villages in Nepal. Both its Nickel Iron and Lithium Iron batteries are longer-lasting, more durable alternatives to lead acid batteries. 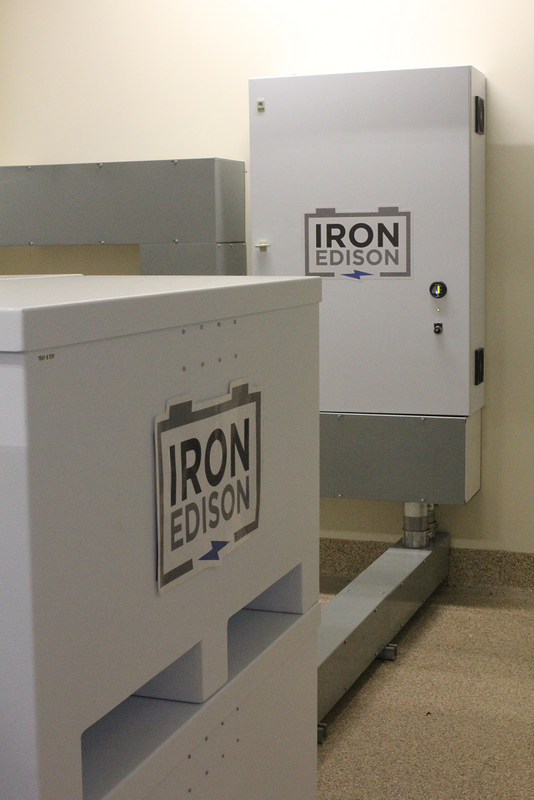 Iron Edison is dedicated to educating people on the benefits of advanced storage battery technology. For more information, contact Iron Edison at (720) 432-6433 or at info(at)ironedison(dot)com.